The quiet, eco-friendly, portable energy station solution of the future is here, thanks to Sparkbox. In providing an illuminating glimpse into the potential of convenient portable power, Sparkbox is introducing a new innovative electric power station it calls “eco-portable energy.” The Sparkbox compact charging station is transforming the energy industry landscape, bringing consumers the capability to power up virtually anything, anywhere, ranging from outdoor activities, including RVs, campers, emergency preparedness to small business, medical device and facility applications. Power: Sparkbox delivers 3 kWh of power (30-amp output), enabling it to charge many power devices, and can be fully charged from empty in a little over three hours. The product will offer 120V & 240V models. Flexibility: Sparkbox comes with Bluetooth capability for iOS, Android, and desktop platforms, enabling remote battery monitoring, charge status alerts, and the ability to control the charger wherever the user goes. AC outlets are available directly on the case, and there are two onboard 3A USB chargers and a 12V CLA for convenient use. Sparkbox is weather & splash resistant, and features integrated wheels & handles built for rugged outdoor use. Sustainability: Sparkbox requires no fuel, is quiet, has zero emissions, can be recharged thousands of times, ideal for indoor & outdoor use, and delivers a sustainable energy alternative to bulky, noisy gas-powered generators that also require costly fuel storage. Affordability: Sparkbox will range in price from $1299-$1599, half the price of any comparable solution on the market. 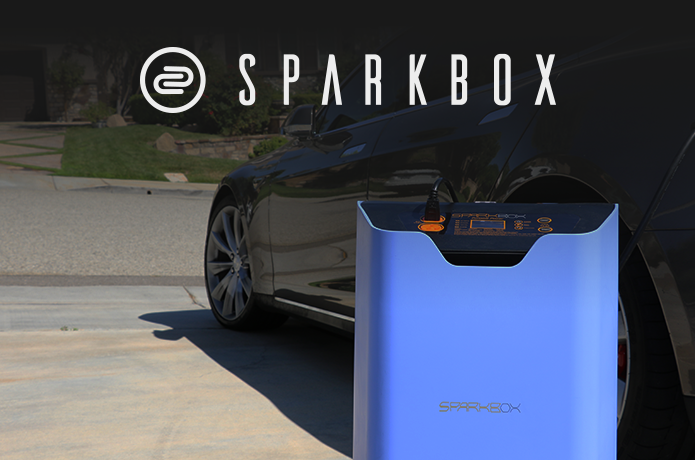 Sparkbox is launching an Indiegogo campaign to bring its products to market. With more than 30 years’ experience in manufacturing consumer electronics, the Sparkbox team is on a mission to reinvent the portable generator industry in launching a new innovative design it calls “eco-portable energy.” The Sparkbox compact electric generator is transforming the energy industry landscape, bringing consumers the capability to power up virtually anything, no matter their location, ranging from outdoor activities, including electric vehicles, RVs, campers, tailgaters, emergency preparedness to small business, medical devices, and facility applications.